Without a gym membership, many people feel lost when it comes to staying in shape as winter approaches. Skiing and ice hockey are great sports, but they can be costly and require a lot of training, traveling and planning. However, with a little creativity and some basic equipment it's not hard, and can even be fun, to stay in shape all winter long. Here are some low-cost ideas to keep fit outside the gym this season. If you need more of a challenge, use the modification tips to take it up a notch. Running or walking up and down the stairs in your house or apartment building can be a great high intensity cardio and leg workout. One option for those starting out is to add walking intervals every few floors. For example, leave the stairwell and walk the length of the hallway and back before resuming your ascent. Try climbing two steps at a time, sprinting a few flights or doing jumping jacks between floors to raise the intensity. This is a great aerobic and social workout that can be done free of charge in some arenas. If triple axels are not in your repertoire, you can still pick up the pace to get your heart pumping. Skating backwards can also work your muscles in different ways. Skate as fast as you can for 10 metres. Come to a complete stop and touch the ice with your hand. Immediately sprint back to the starting spot and touch the ice again. Do this for one minute, three times. 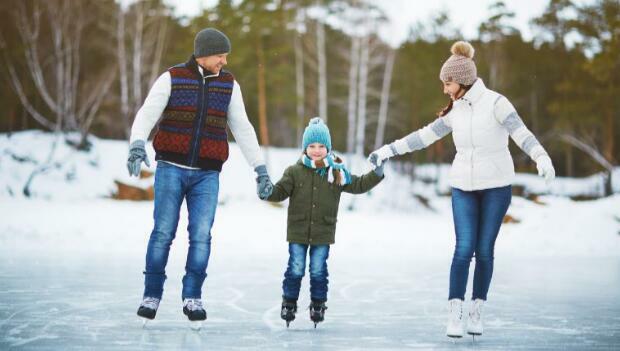 Skate leisurely for one to two minutes between sets to catch your breath. As you get better at it, try going for longer periods, change your distance or reduce your rest time. Join a team or individual sports program. Competition levels can range from recreational to expert. The most cost effective programs are usually run by local municipalities where gym space at a local school or community centre is secured and people drop in for a game of basketball, floor hockey or other team sports. You can also sign up for any number of aerobics classes, dance classes or other group fitness sessions. If you have the time, try combining more than one workout each day. Try a yoga class right after pick-up basketball or Zumba in the morning and volleyball at night.